Here we go again. Lately, on the bootloader front, it seems companies are waffling in their stances. You have Samsung devices with locked bootloaders and Motorola unlocking bootloaders. 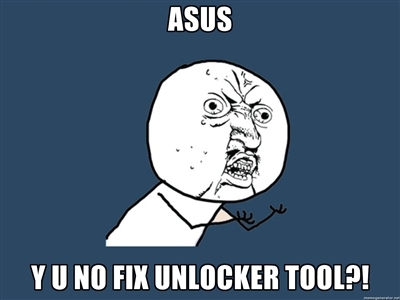 One OEM that has been usually compliant with the demands of their customers is ASUS. We’ve brought you news on their frequently released unlocker tools before. As it turns out, one of them isn’t working. An unknown error occurs, which may be a network connection issue. XDA Senior Member nhshah7 created a thread on the matter to see how many users were affected. As it turns out, quite a few are. Developers and members alike became perplexed at the problems so they went about finding methods to fix the issue. D/KeyBoxService(10158): === Retry after 600 seconds. I cannot speak for other countries or regions, but if you are located in the US or Canada, our facilities do have a fix for the unlock error. However, as Mason said, it does require that you send it in for RMA. The call center and technical support might not be aware, but our technicians already know the procedure on how to fix it. I apologize to all of those who have tried to get an RMA for this through the call center. They are instructed not to assist with issues regarding unlocking device – as we all are. However, we understand that this is a special issue, and have set-up a repair process for the affected tablets. Granted, this is for US and Canadian customers only. However, this is a positive step forward, and it could lead to support for other countries as well. For more information, check out the original thread.